The Louisville Institute has awarded a grant to the Pastor-to-Pastor program administered by Gustavus Adolphus College, in conjunction with the ELCA's Southwest Minnesota Synod. P.A. Mattson Hall on the campus of Gustavus Adolphus College opened its doors to students for the first time at the beginning of the 2005 spring semester. Three women, Christian, Muslim, and Jewish, who live the realities of the Israeli-Palestinian conflict will share their experiences in a presentation, titled "Jerusalem Women Speak: Three Women, Three Faiths, One Shared Vision." 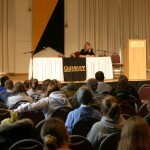 The "4 on the 4th" poetry event scheduled for April 4, 2005 at Gustavus Adolphus College has been postponed.